One of my favorite TV shows growing up was Franc White’s The Southern Sportsman. I’ll never forget how he signed off each episode with, “Do yourself a favor, take a kid fishing.” I liked it so much, I used it as one of my senior quotes in high school. Most of us, if we are lucky, have found an activity or pastime we are passionate about. In many cases, these have been passed down from our parents. Personally, my life hasn’t been the same since the day my father first introduced me to fishing. I couldn’t have been more than three or four years old, but I remember sitting on the edge of the dock at a pond we used to fish in Goochland, staring at my bobber in the water, waiting for a fish to bite. Once my two younger brothers were old enough, we fished almost every weekend with my father. We grew up out there, learned about being outdoors, and all the wonders nature holds. Since then, fishing has been a driving force in my life. It has affected where I have worked and where I have gone to school. It has taken me to places I never would have visited, and introduced me to good friends I never would have met. Of course, fishing is something I naturally wanted to pass down to my two children. In the process, I have learned the only thing better than catching a fish yourself is seeing your son or daughter wide-eyed and smiling with a fish dangling at the end of a line. Like anything, if you haven’t done it before, it can be intimidating. I run into parents all the time who have children who are interested in fishing, but who don’t know anything about it themselves. Fortunately, fishing really isn’t that difficult, and it doesn’t take a great investment of time or money to get started. One of the biggest misconceptions about fishing is that you have to go a long way to do it. In fact, Richmonders have plenty of opportunities within the city and surrounding counties. I hope this information will help you feel comfortable enough to take the kids fishing sometime soon. What sort of rod do I need? You can get a basic rod and reel at Walmart or Target. You don’t need to spend a fortune. Those little Barbie rods work just fine. Any spin-casting combo (the ones with the buttons) will suit your needs around the city. If you want a little help picking one out, I suggest going to Green Top Sporting Goods or Bass Pro Shops. They have people on hand that can help you get everything you need. What do you fish with? The most important thing when it comes to fishing with kids is actually catching fish. The best way to do that in most local ponds is to use bait. Don’t go out there trying to catch the biggest fish in the pond. Use a bobber placed twelve to eighteen inches above a small hook with a little bit of worm (an inch long) or a small piece of bread balled up on the hook for bait. One twist I find fun with my kids is to find our own bait before we go. Turning over a few pieces of slate or rocks in the backyard will usually get you enough worms for a short outing. Here’s another hint: Bluegill love bread in the ponds where people regularly feed ducks and geese. One way to get them turned on is to throw some small pieces of bread out before you start fishing. As kids get older, six or seven maybe, and they can cast well enough to fend for themselves a little bit, I will sometimes switch to lures, but even then I stick to small spinners and grubs. Old classics like Mepps and Panther Martin spinners work great for a variety of species, and you can find them at any store that sells fishing tackle. Two-inch, curly tail grubs threaded on a 1/32 or 1/16-oz jig head are hard to beat as well. I tend to stick to light colors you can see in the water. You want something they can cast out and reel back in with a decent chance of catching a fish. As a general rule, the smaller the lure, the more fish you will catch. Where to go? Almost every body of water has a few fish in it. They might not be big, but even a small bluegill is more than enough to entertain a kid. The University of Richmond’s pond is loaded with small bluegill as are the lakes at Bryan Park in Richmond. Henrico and Chesterfield have plenty of parks with fish including Deep Run Park and Pocahontas State Park. Pocahontas also has canoe and paddleboat rentals during warmer months. The James River is a great option for older kids. Next year, look for the shad to stack up at the fall line downtown from about mid-March until the middle of May. Casting spoons and grubs from the rocks and beach near Fourteenth Street offers a high likelihood of success, making it perfect for kids and families. As we get into summer, smallmouth bass and sunfish regularly bite small grubs anywhere in the James River Park. The Department of Game and Inland Fisheries regularly stocks Shields Lake at Byrd Park and the pond at Dorey Park in Henrico as part of its urban trout fishing program. These stocked trout will bite power-bait and spinners. For information on the urban trout program visit and to learn when a local pond was stocked, check dgif.virginia.gov. Do I need a fishing license? Kids under sixteen do not need a fishing license, but parents do. Even if you are just helping your child fish, you should have a license. If you are fishing for trout, you need a trout stamp from November 1 through April 30. Resident fishing licenses are inexpensive and can be purchased at almost any store which sells fishing equipment or online at dgif.virginia.gov. What if the fish aren’t biting? Kids can get bored pretty quickly if they aren’t catching fish, but there is almost always something fun to do – like chasing frogs or skipping rocks. Don’t be afraid to mix it up if nothing is biting. It’s all about having fun outside. You want it to be a positive experience whether you catch anything or not. Bring some snacks and drinks and be prepared to deviate from the plan to keep your kids entertained. One thing I have tried to abide by with my kids is letting them choose when to pack it in. I don’t want to force them to stay out there, even if I am not ready to leave. The most important thing is that they have fun and view fishing as an enjoyable thing to do with the family. I urge you to get out there this year and give fishing a shot. You and the kids won’t regret it. 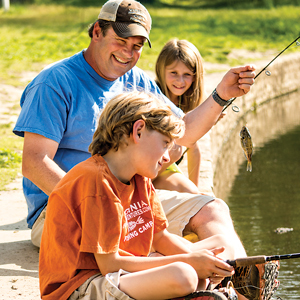 Tee Clarkson writes the Outdoors Column for the Richmond Times Dispatch and runs Virginia Fishing Adventures and Virginia Outside, offering summer fishing and mountain bike camps for kids in the Richmond area and throughout Virginia. You’ll likely see him out there around town fishing with his kid, Thomas, and Lil, and wife Megan. He is happy to field any fishing or outdoor questions to help you and your family get pointed in the right direction: tsclarkson@virginiaoutside.com.